It's been a long time coming, but Clark and I are very excited to announce that our award-winning, feature-length documentary 'The Crossing' about our '1000 Hour Day' expedition back in 2005/8 when we hauled our wheeled crafts across Victoria Island in the Canadian Arctic has now run it's course at the Australian cinemas and is now available for purchase on DVD! You can buy your copy of the DVD (86-min, all-regions, packed with special features and deleted scenes) on the 'Book & Doco' page of our website now: CLICK HERE! Price is only $24.98 including delivery for Australia, and just a little extra for overseas delivery. The DVD is PAL, which means it will only work in countries that use the PAL DVD format (as opposed to NTSC DVD format). If you're not sure which format your country uses, click here. "Award-winning, feature-length documentary following two young Australians, Chris Bray and Clark Carter as they set off on the adventure of a lifetime, attempting to drag their home made kayaks more than one thousand kilometres across a remote arctic island. They battle freezing conditions, knee-deep mud, razor sharp rocks, get chased by wolves and dodge polar bears until, after 58 days alone in the wilderness, they find themselves exhausted and defeated. Unable to let go of their dream, they return three years later. Their return journey is an incredible tale of ambition and heart, where the two men realise that the island isn�t about to let them across without a fight. 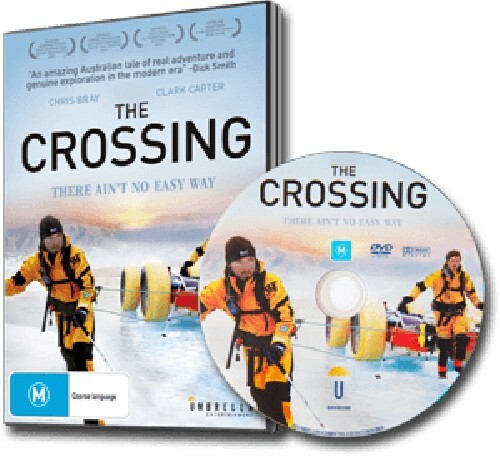 Edited from more than a hundred hours of stunning high-definition footage, The Crossing is an insight into the minds of two young adventurers biting off far more than they can chew and living to tell the tale." You can also still buy the book, "1000 Hour Day" on our website too. And what are Clark and I up to these days? Well, I'm still busy running photography safaris all around the world (Kenya, Galapagos, Amazon, Alaska, Iceland, Greenland, Patagonia, Antarctica & more!) and taking a few months off each year with my now wife, Jess, to sail my little wooden junk-rigged sailing boat www.YachtTeleport.com further down the coast of Alaska after becoming the first to sail such a bat through the icy Northwest Passage a few years back, and Clark has been busy too, working on various films and TV series with the company that created our documentary, Distracted Media, and recently partnering with a friend to start a new company, Traverse Media, currently creating (among other things) an exciting adventure TV series for Australian Geographic. Best wishes to you all, and I hope you enjoy re-living our 1000 Hour Day expedition through our new documentary! Can't wait to watch this at last! We were there just last month in our RV headed for Helena from Georgia. We enyjoed seeing all 5 bears. We actually returned on a 2nd day just to see Brutus. Sorry that you were not there too. We would have enyjoed seeing you.We have recommended your Encounter many people in the RV Camp in Bozeman and Helena.. Thanks too for the map of Bozeman. It was most helpful in finding our way around. Youreally should put some flyers at Bear Canyon RV Camp. They didn't seem to know anything about you!